Since Earl and I are both paranoid about being late, we planned to leave the hotel at 7:00 AM for our 10:30 flight to Cairo on Turkish Air. 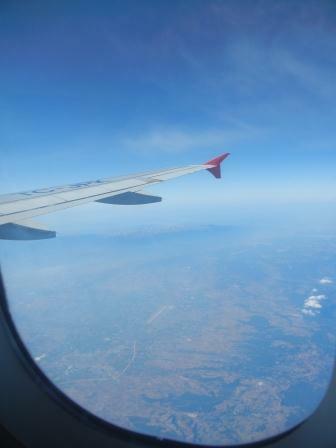 We ended up being really early at leaving by 6:30 AM and the traffic to the airport was VERY light at 6:30 AM. The traffic from the airport at 2:00 AM on Friday night was probably 3 times as heavy. So, we got to the airport right and 7 and were through passport control by 8, giving up time to kill in the Istanbul airport, including for me finally getting a scarf. We headed to the gate at about 9 AM and then went through the “real airport security”. (They have x-ray and metal detectors as you walk in, then go through other security (laptop and liquids out) closer to the gates. Making me think that Kansas City’s airport design isn’t unusual at all when compared to the rest of the world airports. We got to Cairo and then were approached by “officially licensed tourist guide” who arranged a car for us to get to the hotel. Everyone involved got a cut of that deal, the guy who followed us around, the guy who took our bags and the car driver himself. It was not a metered taxi to be sure. The drive to the hotel was unbelievable. Cars were basically 4-wide on an officially (yes there were lines) 3 lane road with scooters and people walking and running across the street. Needless to say, I am not looking forward to that ride again. After arriving we got checked in, had hassles there with the hotel disputing the “single vs. double” room and I was getting very frustrated. So, I was glad to finally get to the room. Earl went down to the concierge to talk through how to get to the Egyptian museum tomorrow and look at the options for Nile cruises and the pyramids visits. 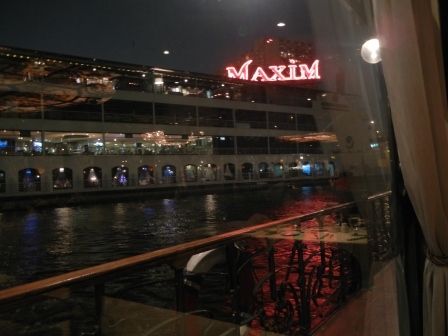 He booked a great Nile cruise, Nile Maxim for that night at 8PM. We were told that we had to be there by 730 PM and that a taxi would take about 15 mins. So we left the hotel at 7:00 PM and then arrived on the boat at 6:15 PM and were the first ones there. Did we have a magic taxi? No, apparently the world time clocks that Earl and I have said that Cairo was GMT +3 the same as Istanbul, however in reality they are for some reason GMT +2 right now. The cruise itself was nice, they had a wonderful salad buffet and the food was good. 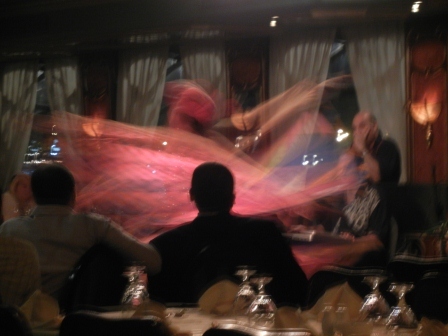 They had singers, then a Whirling Dervish performance and finally a belly dancer. All while sailing up and down the Nile. We also saw a ton of what we would call “disco boats”! These boats were basically constant flashing lights, we got some good video of those boats and of the dervish. Ready for the Egyptian museum!